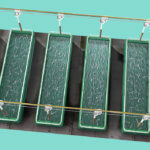 The aquaculture industry is constantly growing and changing, creating a need for dependable, efficient feeding systems to feed many fish in a short amount of time! 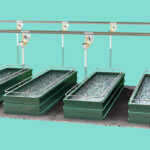 Cablevey Feeding Systems custom manufactures aquaculture feeding systems for operations of all sizes. We believe in creating simple, efficient solutions for complex issues, which is why all of Cablevey’s feeding systems are made up of parts [link to Order Parts] that are easy to understand and each serve a vital purpose in the system as a whole. The pneumatic air tripper controls the opening and closing of the feed drops. Provides versatility and flexibility in designing your feed delivery system. Corners offer capability of making a complete return with as little as 24” between down and black lines. Deposit feed where you want it! 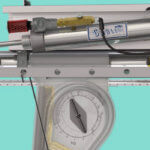 Various sizes of economical weigh drops or volumetric drips are available to accurately meter your feeding requirements. Pulls the cable and discs through the tube to transport feed. A single 1 HP unit can pull up to a 1000’ circuit with as many as eight corners, eliminating costly power heads. Incorporates an automatic take-up to adjust cable tension and a safety cut-off switch to avoid damage to the feeder. Motorized feed roller is designed to keep feed from bridging while moving the feed from the bulk bin into the tubing. Deposit feed where you want it! Various sizes of economical weigh drops or volumetric drops are available to accurately meter your feeding requirements. 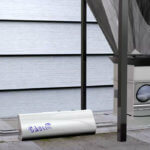 Get the simplicity, efficiency, and durability that Cablevey provides. ©2018 Cablevey Feeding Systems. All Rights Reserved.